This tasty soft and chewy multivitamin is tailored with a blend of nutrients and Evening Primrose Oil. To support daily health, it contains nutrients to aid the health of teenagers, including Zinc for healthy hair and nails and Vitamin B6 to support the balance of hormonal activity. Vitamin B6 supports balance of hormonal activity. Vitamin A, Riboflavin (Vitamin B2) & Zinc help support healthy skin, Vitamin C helps collagen formation for healthy skin & Vitamin E is an antioxidant as it contributes to the protection of cells from oxidative stress. Zinc helps support healthy hair and nails. Vitamin C helps collagen formation for healthy teeth & gums & Vitamin D helps support healthy teeth. Vitamin A, Vitamin C & Vitamin D help support the immune system. Vitamins B6 & B12 support normal psychological function. Vitamin A, Riboflavin (Vitamin B2) & Zinc help support healthy vision. Riboflavin (Vitamin B2) & Vitamins B6 & B12 help support the working of the nervous system. Riboflavin (Vitamin B2) & Vitamins B6 & B12 help reduce tiredness & fatigue & contribute to the release of energy from food. Vitamin C increases Iron absorption. Vitamin D helps absorption of Calcium & helps support healthy bones & muscle function. Sweeteners (Maltitol syrup, Sorbitol, Sucralose), Gelatine (Bovine), Vitamin C, Evening primrose oil, Orange flavouring, Emulsifier (SOYA lecithin), Acid (Malic acid), Zinc, Vitamin E, Glazing agent [Vegetable oil (Coconut oil, Palm kernel oil, Sunflower oil), Carnauba wax], Riboflavin (Vitamin B2), Passion fruit flavouring, Vitamin B6, Vitamin A, Colour (Mixed carotenes), Vitamin D, Vitamin B12. Contains naturally occurring sugars. 30 one a day soft & chewies. Do not exceed the suggested daily intake. Do not take Vitamin A supplements if you are pregnant or planning to become pregnant in the near future, except on the advice of a doctor. Contains Maltitol and Sorbitol which are polyols – excessive consumption may cause a laxative effect. Food supplements should not be used as a substitute for a balanced, varied diet and healthy lifestyle. Not suitable for children under the age of 12. For more information check FAQs. 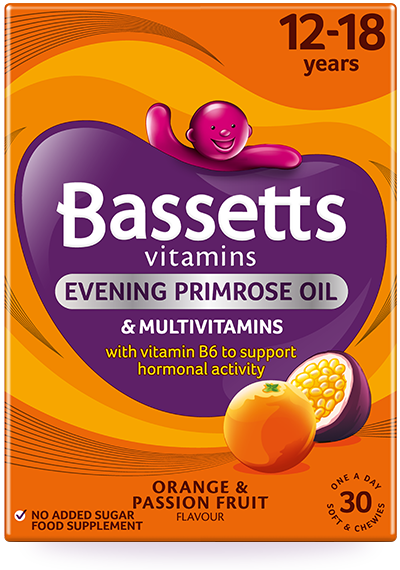 Bassetts Vitamins are widely available across the UK from supermarkets and pharmacies.